This page shows various forms of textual emendation. 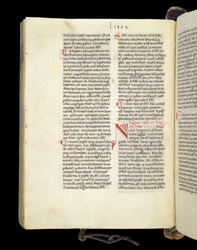 In the two-line rubric the roman numerals 'iii' and 'iiii' have been altered to 'ii' and 'iii'; the word 'liber' (book) has been changed to 'libri'; and the word 'Prologus' (prologue) has been inserted. In numerous other places corrections have been added between the lines of text.